Going without so we can give within our community. Last night we talked about our second week in Revolution: Dare To Change The World, our current series. After brainstorming some ideas of places we could volunteer as a Life Group, Elias spoke up with an idea that had been rattling around in his dome. He realized that most of his budget went to eating out. 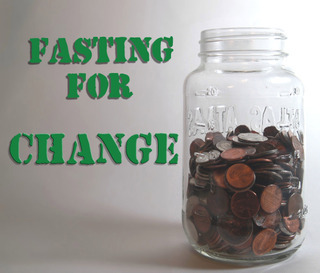 What would happen, he wondered, if we all committed to fasting once a week, praying for those in need in our community, and then doing something with the money we all saved from those meals. With potentially hundreds of dollars at the end of the month we could give it to a shelter, stock the food pantry for homeless at the church, or just fill up a grocery cart and hand it out to those in need. After staring blankly for a few moments, Shawna spoke up. "Wow, that’s kinda…radical. Kinda revolutionary, I guess. I think that’s a good thing." Thus we’re giving it a try. For the next three months we are going to fast every Thursday. We’ll focus on and pray for the needy in our local community, then pool that money to make a difference somehow each month. We’re excited to see what could result. Both from fasting together as a group, and from giving. Check out the "Cause" we created on Facebook…and feel free to join us. Do you go to CLC? join us. Invite your Life Group to join us. Don’t live near Santa Cruz, or Cali for that matter, jump in and grab some peeps from your area to bless your local community. Here we go! Let’s change our proclamation into demonstration!